Sign up ahead of time for the Shore Poets Open Night in April! It’s almost time for the annual Shore Poets Open Night, which means it’s time for YOU to start polishing up your best poems to perform for our warm and friendly April audience! This year the Open Night takes place on Sunday 27th April at our usual time, 7.45pm (doors 7.15pm) and our usual venue, Henderson’s at St John’s. There’ll be time for twelve poets to read for five minutes each, and slots are already filling up! Email publicity@shorepoets.org.uk ASAP in order to make sure you get chance to perform. Please note that we want to give priority to new readers. If you’ve read for us before, you can still sign up, but we’ll prioritise newbies first! There’ll be a feature reading from Alan Gillis, author of the poetry collections Somebody Somewhere, Hawks and Doves (shortlisted for the TS Eliot Prize), and Here Comes The Night (all Gallery Press), and of course, all our usual delights including live music and the infamous lemon cake. More info on all that — and on our March event! — later, but for now… publicity@shorepoets.org.uk to sign up! 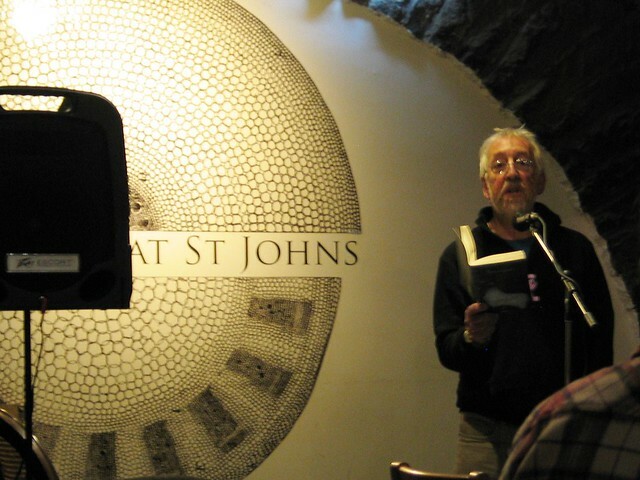 See who read last year, along with some photos from the 2013 Open Night, right here. Here’s our very deserving 2014 winner of the Mark Ogle Memorial Award, Meg Bateman. 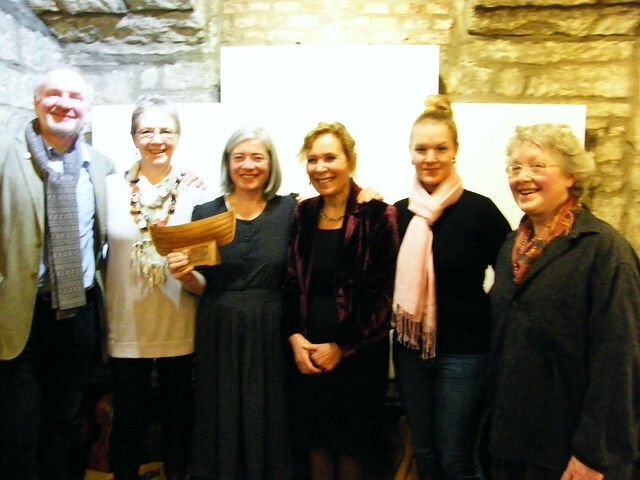 From left to right: 2012 MOMA winner Tom Pow, Jane Read, 2014 MOMA winner Meg, Deborah Mather, Sandra Engstrom, 2013 MOMA winner Anna Crowe. Congratulations to Meg! And thank you very much to everyone who attended our February event! Happy February, friends! Thankfully, winter is nearly over, and Spring is coming. To celebrate, we have a massive event for you this month, with lots of special happenings. Have a look! Our headline poets (no Shore Poet slot this month!) are Diana Hendry and Stewart Conn. Stewart Conn is one of Scotland’s leading poets. He was born in Glasgow but has lived in Edinburgh since 1977, where until 1992 he was head of radio drama for BBC Scotland. 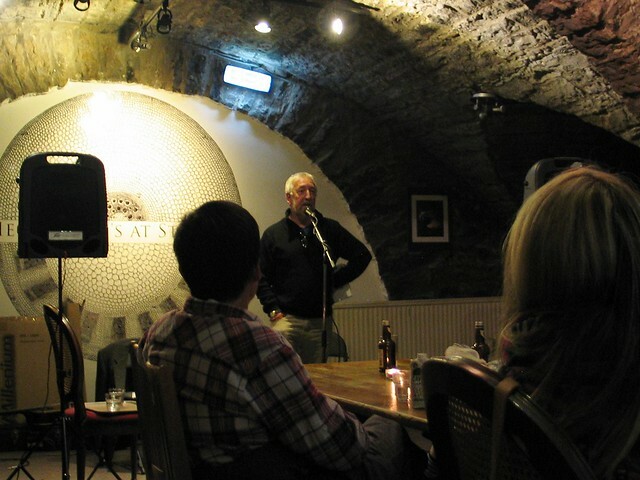 He was Edinburgh’s first Makar, or Poet Laureate, 2002-2005. His collection The Breakfast Room (2010) won the SMIT Book Awards Poetry Book of the Year. His most recent publication is Estuary (Mariscat Press 2012) and The Touch of Time: New & Selected Poems is forthcoming next month from Bloodaxe Books. He is Honorary President of Shore Poets. 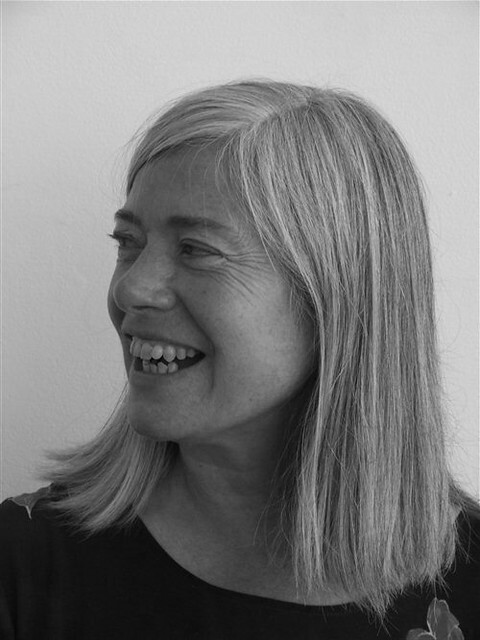 Diana Hendry is an Honorary member of Shore Poets. She has published five collections of poems. Her latest, published last year, is The Seed-box Lantern: New & Selected Poems (Mariscat Press). She has also written over forty books for children, including Harvey Angell, which won a Whitbread Award, and recently The Seeing, which was shortlisted for the Costa Prize. She has been Writer in Residence at Dumfries and Galloway Royal Infirmary and a Royal Literary Fund Fellow at Edinburgh University. She lives in Edinburgh. In a change to our original billing, our new poet will now be Lesley Glaister. Lesley is well-known for her fiction writing, but has only recently begun to compose poetry. 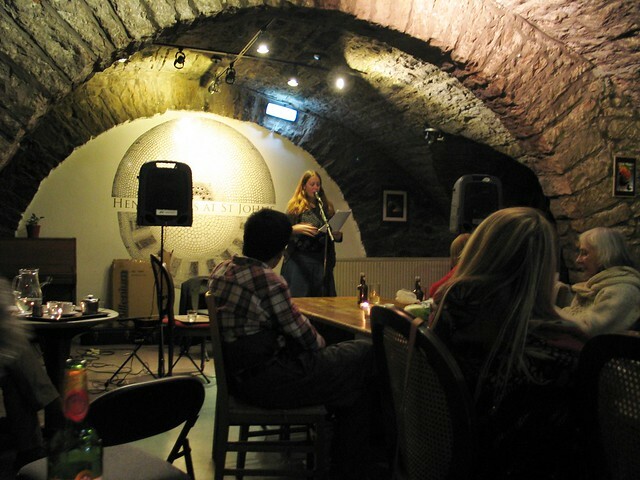 The Shore Poets feel privileged to offer her a first-ever poetry reading slot in Edinburgh. We hope lots of you will come and help us to welcome her. 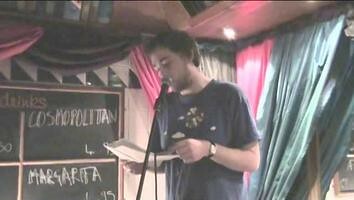 We hope that William Letford, originally billed as our new poet for the month, will join us sometime in the 2014/15 season. 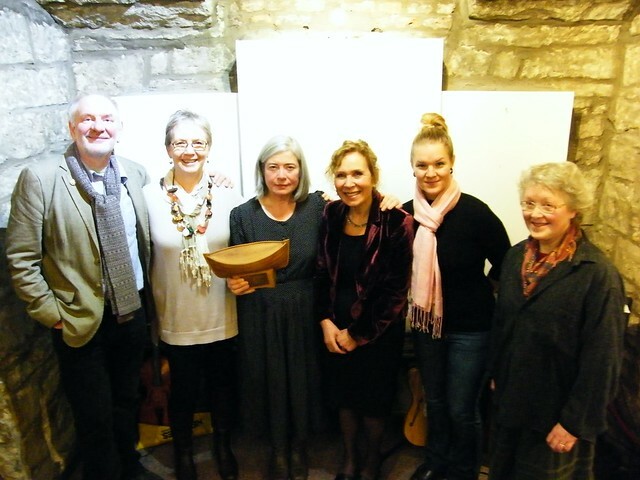 This month we will also be presenting the Mark Ogle Memorial Award to Meg Bateman. 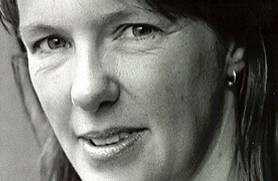 Meg Bateman was born in 1959 in Edinburgh, studied Gaelic at the University of Aberdeen, and holds a PhD in Classical Gaelic religious poetry. Her first collection, Òrain Ghaoil / Amhráin Grá was published, with facing Irish translations by Alex Osborne, in 1990. In English, the title is “Love Songs.” Poems from Òrain Ghaoil were republished in Aotromachd agus Dàin Eile in 1997. Meg’s third collection, Soirbheas, was published in 2007. 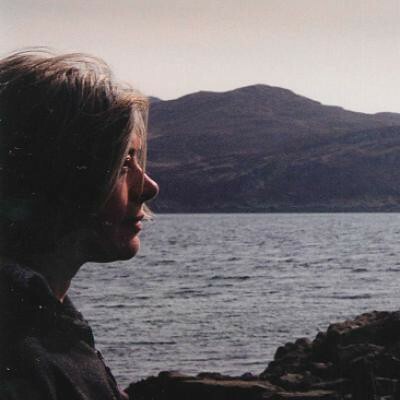 She lives in Skye with her son and teaches at the Gaelic college, Sabhal Mòr Ostaig. As usual, we’ll also have our two wildcard slots up for grabs, where YOU can read alongside this amazing line-up! Just bring a poem you’d like to perform, put your name in the hat when you arrive at the door, and wait to see if your name is picked! All topped off by our delicious lemon cake raffle. Let us know you’re coming at our Facebook event! Happy New Year, poetry fans! Shore Poets has been enjoying a restful Christmas break, and we hope you have, too. But now we’re back, with a truly fabulous line-up to kick off your literary year. Check it out! 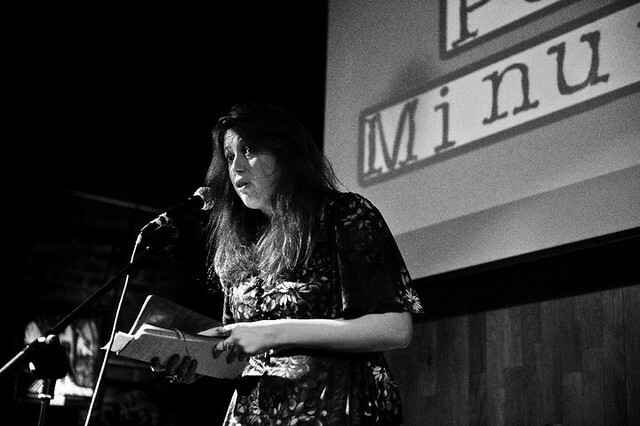 The headline poet for this brand new New Year session is Kathleen Jamie. Kathleen was born in Renfrewshire, grew up in Currie and attended the University of Edinburgh, reading for a degree in Philosophy. She won an Eric Gregory Award in 1981 aged just 19, and her first collection, Black Spiders, was published the following year. Since then, she has published many other collections, including the well known and well loved The Queen of Sheba in 1994. Her most recent collection, The Overhaul, published in 2012, won the Costa Prize and was shortlisted for the TS Eliot Prize. She holds the Chair in Creative Writing at Stirling University. You can hear readings of her poems at poetryarchive.org, and read more about her work at spl.org.uk. 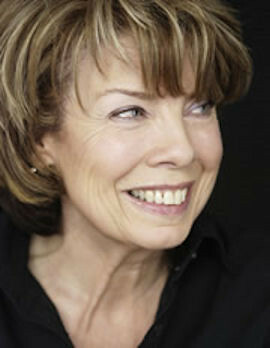 Our Shore Poet this month is Jane McKie. Jane is the author of two poetry collections: Morocco Rococo (Cinnamon, 2007), and When the sun turns green (Polygon, 2009). 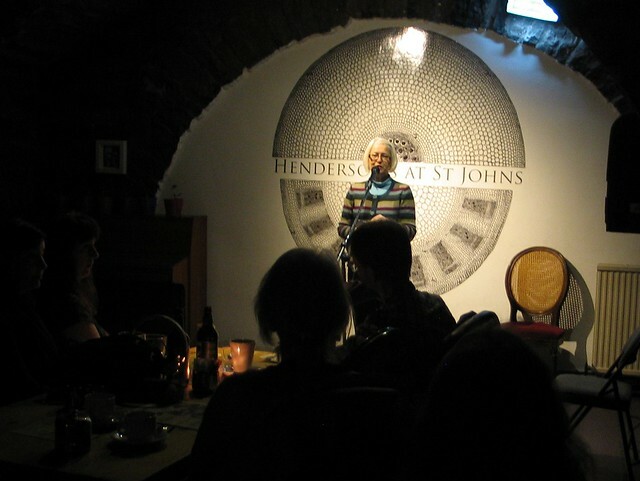 The former won the Sundial Award for best first book of 2007, and in 2011, Jane won the Edwin Morgan Poetry Prize. Her most recent publication is Garden of Bedsteads, also 2011 (Mariscat Press). She teaches on the University of Edinburgh’s MSc Creative Writing programme, and is also a creative facilitator for the Making It Home project, based at Maryhill Integration Network in Glasgow. Michael Pedersen is our January New Poet. Michael is from Edinburgh and has published two poetry chapbooks: Part-Truths (Koo Press) and The Basic Algebra of Buttering Bread (Windfall Books). His first full collection, Play with Me, was published by Polygon in 2013 and blurbed by none other than Stephen Fry (yes, that Stephen Fry). Michael helps to run the monthly literary cabaret Neu! Reekie!, alongside Rebel Inc editor and veteran Scottish counter-culture poet Kevin Williamson. Michael is also a songwriter and has worked on various poetic and musical collaborations. Follow him on Twitter via @scribepedersen for more. There’ll be a chance for YOU to read your work as part of this stellar line up, too! Just bring a poem, put your name in the hat at the door when you arrive, and you may be picked for one of our TWO three-minute wildcard slots! We’ll also have live music and of course, our lemon cake raffle! 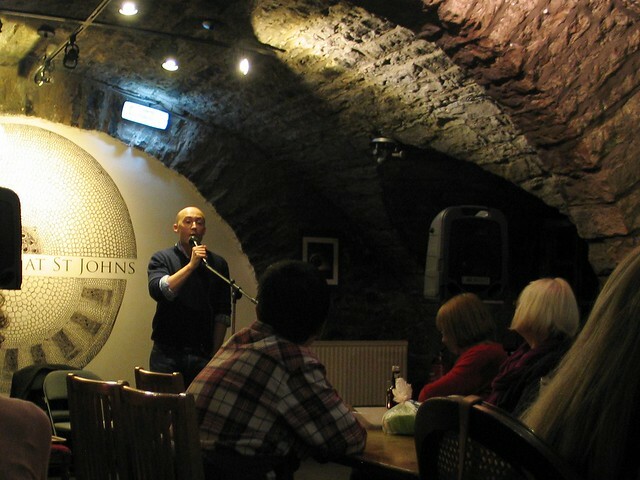 Are you ready for a last showcase of brilliant Scottish poetry before the Christmas break? It’s time for Shore Poets November! Our November headline poet, Gerrie Fellows, was born in New Zealand, lives in Glasgow, and works as a creative writing tutor. 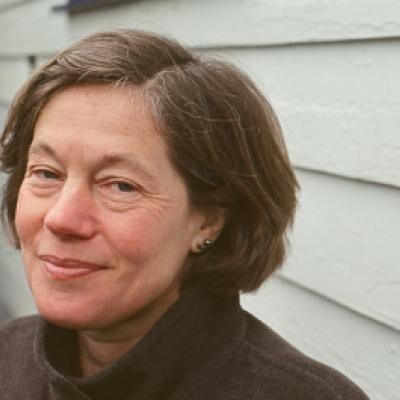 Her first collection, Technologies and other poems, was published by Polygon in 1990, and ten years later they also published The Powerlines, a collection that traces Scottish and New Zealand connections through a variety of women’s voices. The Duntroon Toponymy was published by Mariscat in 2001, and Window for a Small Blue Child by Carcanet in 2007. You can read some of Gerrie’s poem at the Scottish Poetry Library website. There’ll also be chance for YOU to read your work as part of this stellar line up! Just bring a poem, put your name in the hat at the door when you arrive, and you may be picked for one of our TWO three-minute wildcard slots! We’ll also have live music from Andy Miller, and of course, our lemon cake raffle! Let us know you’re coming — and invite your friends — using our Facebook event! It was a dark, wild and windy night on 27th October, so we’re extra super grateful to all the lovely folks who braved the elements to come and hear poetry. Thank you! In case you couldn’t make it, here are a few photos of our October readers. Our fabulous host, Nancy Somerville, kicking off the night. The new poet was the great Graeme Hawley, a Scottish Slam Champion and organiser of Tricolour, a monthly poetry night at the National Library. 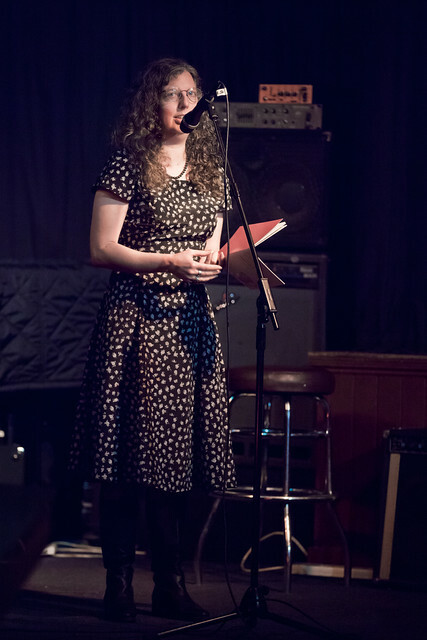 The Shore Poet was Claire Askew, brand new Young Adult Project Co-Ordinator at the Scottish Book Trust, and blogger at One Night Stanzas. 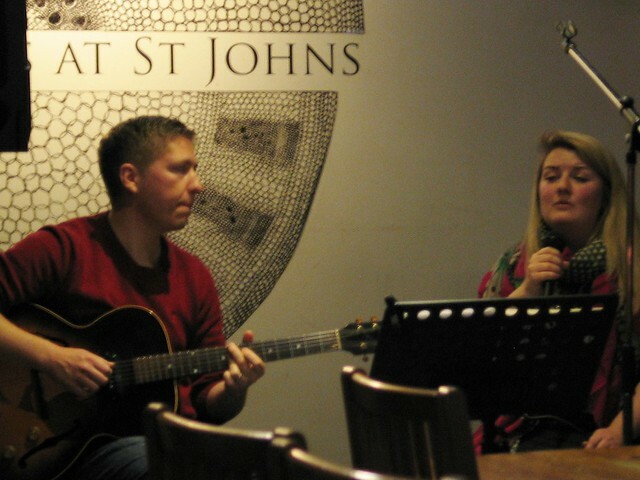 Music was provided by Tea for Two, who’d love it if you ‘liked’ them on Facebook! And our headline poet was Gerry Loose — prolific poet and writer, Writer in Residence at Dawyck Botanical Garden, and garden-builder. Find out more at his website! Our next event is on Sunday 24th November at the usual time (7.45pm, doors at 7.15pm) and in the usual place (Henderson’s at St John’s). Details will be posted here soon! Remember, there are now TWO wildcard slots up for grabs, too — bring along a poem, put your name into the hat when you pay at the door, and you too could be reading your work to our lovely audience. There’ll also be a raffle to win our [in]famous lemon cake, as well as cakes, tea, coffee, beers and other delights for purchase at Henderson’s counter of delights… and of course, a warm atmosphere! Hello again, fans and friends! September’s Shore Poet is Angela McSeveney. 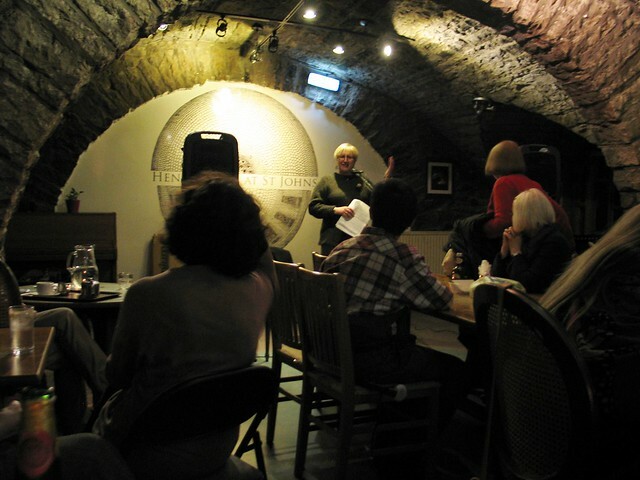 Angela’s first collection of poems, Coming Out With It, was published in 1992, after she received advice and encouragement from fellow writers Liz Lochhead and Ron Butlin. She has since published several other books of poetry, the most recent of which, Slaughtering Beetroot, was produced by Mariscat Press in 2008. 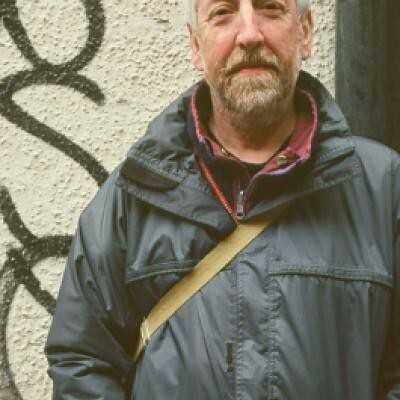 Our new poet this month is Roddy Shippin. 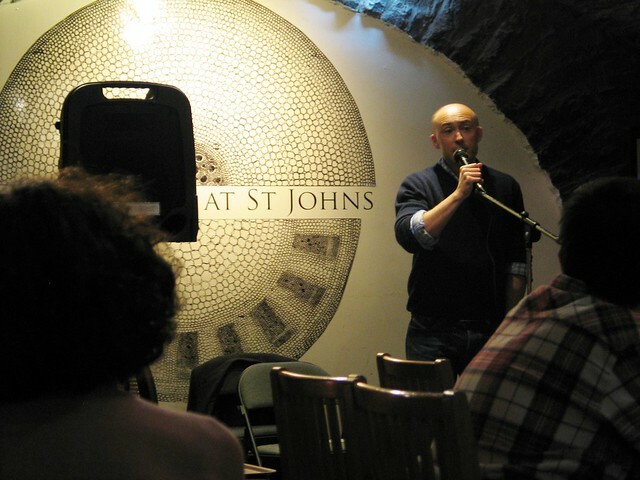 Roddy is an exciting new voice in Scottish poetry: his work has been published by Poetry Scotland, Ink Sweat & Tears, a handful of stones and One Night Stanzas, among others, and he is one half of the creative team behind the popular monthly spoken word night Blind Poetics. You can read one of Roddy’s poems, Casebook, here. Our live music for the evening will be provided by Various Moons. We’ll also be playing host to our now-regular SP Wildcard Poet… that could be YOU! If you fancy entertaining us with a poem, just put your name in the hat when you pay at the door. One name will be drawn, and that person will get to open proceedings with a poem. Be sure to bring your best work with you! And of course, a Shore Poets event wouldn’t be complete without our infamous lemon cake raffle. We hope you’ll come and help us kick off our new season with a bang! Let us know you’re coming — and invite your friends — using our Facebook event! Arrive early to nab a good seat! Well, it’s the last event of the Shore Poets 2012-2013 season, before we take a short break over the summer (we’ll be back in September!). It’s been a great year, and we thought we’d end on a high. 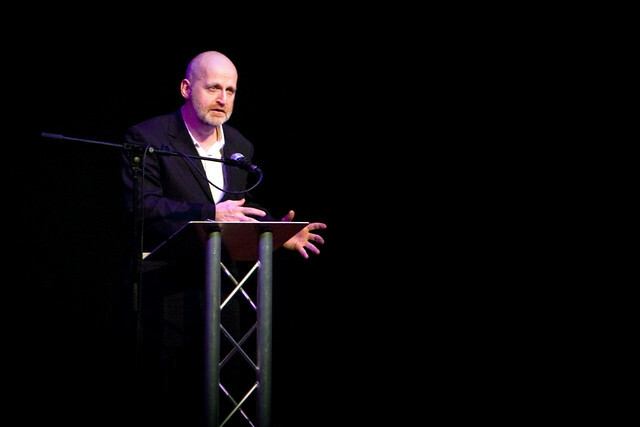 We’re very excited to announce that our headline poet this month is the inimitable Don Paterson. His collections of poetry are Nil Nil (Faber, 1993), God’s Gift to Women (Faber, 1997), The Eyes (after Antonio Machado, Faber, 1999), Landing Light (Faber, 2003; Graywolf, 2004), Orpheus (a version of Rilke’s Die Sonette an Orpheus, Faber, 2006) and Rain (Faber, 2009; Farrar, Straus and Giroux, 2010). He has published two books of aphorism, The Book of Shadows (Picador, 2004) and The Blind Eye (Faber, 2007), and a compendium, Best Thought, Worst Thought (Graywolf, 2008). He has also edited a number of anthologies. His poetry has won a number of awards, including the Forward Prize for Best First Collection, the Whitbread Poetry Prize, the Geoffrey Faber Memorial Award, and the T S Eliot Prize on two occasions. Most recently, Rain won the 2009 Forward prize. 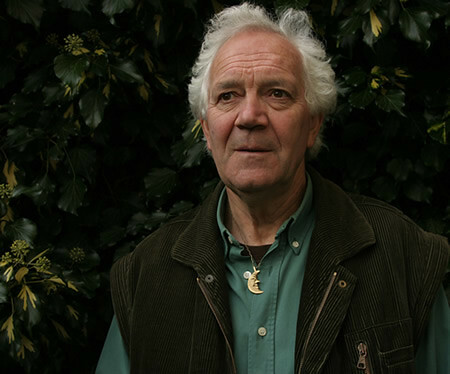 He is a Fellow of the Royal Society of Literature and a Fellow of the English Association; he received the OBE in 2008 and the Queen’s Gold Medal for Poetry in 2010. Don has been the poetry editor for Picador since 1996, and is also a musician. We’re greatly looking forward to hearing him read, and advise everyone to come along early to this event, as we’re expecting a high turnout! The Shore Poet month is Nancy Somerville, and our ‘new poet’ slot is being ably filled by Clydebuilters — representatives of the Glasgow-based Clydebuilt poetry apprenticeship scheme, which you can read more about at the Scottish Poetry Library website. Our Shore Poets wildcard slot is also up for grabs! In case you’re unfamiliar with the concept, you basically just need to turn up, clutching one poem (and one poem only), and put your name into our ‘poet hat’ when you pay at the door. One name will be pulled from the hat at the start of the night, and that person will kick off the night for us by reading their poem. We hope you’ll be brave enough to have a go! Of course, we’ll also have live music on the night — this month, we’re delighted to welcome Tom Fairnie. Tom is an Edinburgh based singer/songwriter with a rich background of performance and recorded collaborations with other poets and musicians. You can read more about him at his website. And last but not least, you’ll also be able to buy tickets for our infamous lemon cake raffle. Still fuelled by all the excitement of our open night, we’re bringing you a brilliant evening of poetry and music for May! Our headline poet is Meg Bateman. 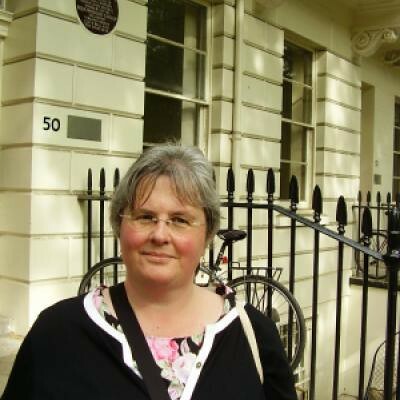 Meg was born in 1959 in Edinburgh, studied Gaelic at the University of Aberdeen, and holds a PhD in Classical Gaelic religious poetry. Her first collection, Òrain Ghaoil / Amhráin Grá was published, with facing Irish translations by Alex Osborne, in 1990. In English, the title is “Love Songs.” Poems from Òrain Ghaoil were republished in Aotromachd agus Dàin Eile in 1997. Meg’s third collection, Soirbheas, was published in 2007. She lives in Skye with her son and teaches at the Gaelic college, Sabhal Mòr Ostaig. There will also be poetry from our New Poet Iain Matheson, and the Shore Poet this month is Martin McIntyre. A reminder: although there was a brief hiatus for the open night, the Shore Poets wildcard slot has now returned. If you want to read one of your poems at our May event, then bring one along with you and put your name into the wildcard hat when you pay at the door. One name will be drawn and open the evening with a poem! We’ll also have live music from the Guerrilla String Quartet, and of course, our famous lemon cake raffle.